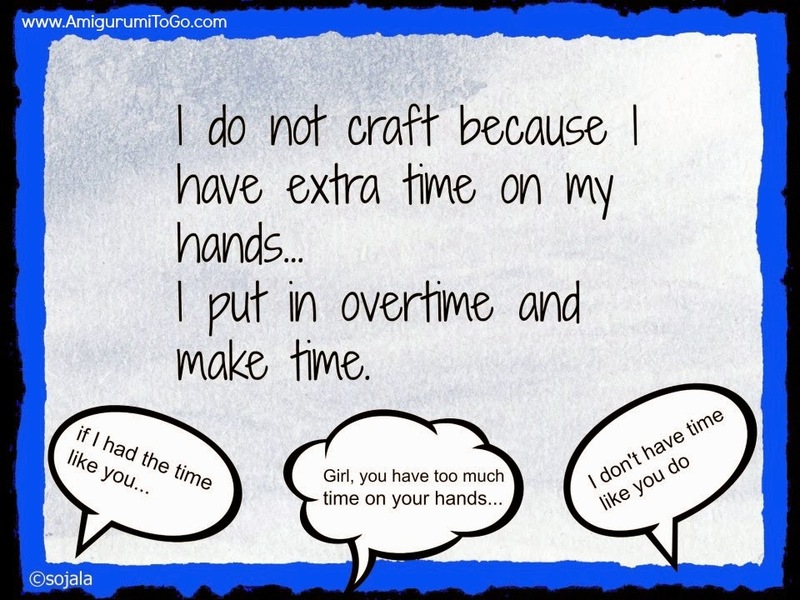 If you do any sort of crafting you most likely have heard the words, "If I had time like you have..." or "You have too much time on your hands" These thoughtless comments make me cringe! Thankfully I've never heard these words spoken to me personally but I've seen comments like these posted on facebook on other people's posts. Dear Friend, if you have spent many hours handcrafting something, hours you really don't have to spare and then with relief and satisfaction post a picture of it on facebook for others to see and enjoy only to hear, "You have too much time on your hands" then this post is for you! I know the time you don't have and I know the overtime you have put in to make the things you do. I know the time you put in is overtime! You have sacrificed sleep, your hands are sore, your back hurts a bit and you drink way too much coffee! And I also know that you love it and that crafting is your way of expressing yourself. You put time, effort and feeling into your craft. So I just wanted to give you an online "High Five" and say, "Craft on!! You rock!" That thing you made is awesome and you should be proud! And for the rest of you, hopefully you are very few in number, if you are guilty of saying such things as, "you have too much time on your hands" please refrain from saying such things in the future. It's not nice. It takes away from all the work that goes into handcrafting and it's demoralizing. Comments like that are needless and thoughtless. "Wow, that is awesome" will do nicely instead for we don't have anymore time in the day than you have. We have just put in some overtime! I've seen it quite a few times now on facebook. I wonder why someone would take the time to say that and not include something nice as well? I understand that some folks truly believe they have no time at all to handcraft anything and that we must have all the time in the world, lol but even if that was to be true they could still add in a compliment... but you are right, some don't think before they speak. Well, apparently 'they' do have time, otherwise they won't be able to spend time on facebook or read this blog. It is just the way you spend your 'free' time! I just 'discovered' amigurimi and it is very relaxing to me, sometimes only for 5 minutes, but then I'm 'reloaded' to do things more boring! Keep on crafting and sharing, I enjoy it! I totally agree! I've never had it said to me "thankfully" but I've seen it on facebook a few times now and I am insulted for the person it's been said to... I wish people would think a bit more before leaving such comments or say nothing at all. It takes only one comment to tear a person down and one comment to build a person up. I'd much rather be a builder! Thanks so much for leaving your thoughts today, I appreciate them! "How many hours does it take to do an amigurumi?" They assume it's easy too. exactly! I've actually heard that many, many times too! Thoughtless is the word that comes to me.. I also get a lot of requests from people (mostly friends of friends on facebook) who want to buy yarn, and have me making something for them without paying for the actual job. Like buying the yarn is the hard part... I always say no to those. Wow! We are kindred spirits. This is exactly how I get all my crafting done too. I am normally killing 2 birds with one stone *so to speak* or I am awake crafting when I should be sleeping, lol but yup, it's amazing how others will assume we spend our time... it's a shame. And I agree, the only time I can watch tv is if I have something to do with my hands or I'd die of boredom, haha!! I do watch the odd movie where I am all consumed in the story line but that is rare. And the buying yarn part made me laugh!! What are people thinking... oh my goodness! Anyway, I enjoyed your message and I wish you all the best in your studies and of course happy crafting! !